If you or a loved one has cancer, and you’re looking into alternative therapies, here’s how Traditional Chinese Medicine and Chinese Reflexology can be a complementary support system for helping the body return to balance. It’s not all or nothing. You can take the best from the West and combine it with Eastern healing practices to stack the deck in your favor to restore your health and vitality. In my Sole Fundamentals (Introduction to Chinese Reflexology) program, I host a biweekly Q&A session. During a recent session, two students asked me about cancer. Since I don’t believe in coincidences, I saw this as a sign that it was time to write an article about Chinese Reflexology and cancer. Actually, this is Part One of the article. I started writing and realized partway through that I had already written over a thousand words. But there was still much more to share with you. So I’m going to structure this “article” into three parts and publish each one as I complete it. First I’ll go over the Western and Traditional Chinese Medicine perspectives on cancer. In Part Two, I’ll give the Dragon Spirit view on cancer. Dragon Spirit encompasses the mind and body connection to address the mental and emotional roots behind energy disharmonies that affect your health and vitality. Finally, Part Three will go over recommend Chinese Reflexology points, and other healing practices to support your health and well-being. Please don’t skip parts one and two. These first two parts create the framework and foundation for understanding how Chinese Reflexology supports the body’s natural healing process to help you return to a state of balance—in other words, get healthy and start living your life again. That’s more than 100 diseases. Cancer is a “disease” (more than 100 diseases) that has been identified and labeled by modern medicine. If we want to get into semantics, because modern medicine has defined cancer, then only modern medicine can treat or cure cancer. Therefore, it would be inappropriate to say that Chinese Medicine or any other alternative therapy can cure cancer, or be used to treat cancer, because it is a Western medical disease (well, 100+ of them). This does not mean that there isn’t room for alternative medicine to provide cancer support, or that alternative therapies can’t be used to address the underlying conditions that create an environment in the body that is conducive for the development and progression of symptoms that could be labeled as cancer. Whew, that was a long sentence! The National Cancer Institute states that acupuncture can be used to control the symptoms of cancer treatment. Symptoms include pain, fatigue, vomiting and nausea from chemotherapy, anxiety, depression, insomnia, hot flashes, constipation, diarrhea, and post-surgery failure of the gastrointestinal muscles to move food through the GI tract. Basically, the modern medicine perspective on Traditional Chinese Medicine is that it can help improve the quality of life for a cancer patient. It’s seen as a complementary treatment to conventional cancer treatment—basically a side dish to the main course—or maybe more like a breath mint to combat garlic breath. From a Chinese Medicine perspective, any type of abnormal growth such as a cyst or tumor is due to an “accumulation of toxins” and a lack of flow in the body. Basically, toxins and waste aren’t being cleared away so they build up in the body. Of course, this is an oversimplification of Chinese Medicine theory. TCM also looks at why there are toxins in the body and why they aggregate in one area. What are the underlying disharmonies in the energy meridians that are causing toxins and waste to accumulate? Let’s answer this question with another question (just like a Zen koan!) What causes a build-up of waste in the body that results in the formation an abnormal growth? The answer lies in nature. If you think of a river, when does the river start getting blocked up? It happens when debris falls in and doesn’t get cleared away quickly enough. Debris also accumulates when the flow of water is weak such as when the water level drops unusually low—perhaps during a drought—or there’s a block upstream that’s affecting the flow of water downstream. Normally, the river can handle occasional bits of debris. For example, if a twig or some leaves fall in, the current is strong enough to clear them away. But if the flow of the river is not strong—maybe a recent storm has caused mud to erode into the river and choke off the flow—then the debris starts to pool in areas where the current is especially weak. Toss in an inconsiderate homo sapiens using the pristine banks as their personal garbage dump—throw in a shopping cart and an old car tire (sadly, I saw both of these items in a creek)—and the flow of water is significantly disrupted. Things start collecting and pooling in the river. This results in even more debris getting trapped in the affected area. The debris gets packed tightly, and unfortunately, one bag of trash often attracts other bags as more people start viewing the river as a dumping ground. Eventually, it’s too much, and the river gets blocked resulting in a big crapola mess for the ecosystem. So how does this relate to your body? Your body is the ecosystem. Instead of rivers flowing through it, your body has a network of energy pathways for the flow of qi, your life force energy. This network is similar to the circulatory system for blood or lymph, but these pathways circulate qi. Qi is a powerful force in the body. When energy is flowing as it should, your body is in a state of balance. But if the flow is disrupted, that’s when problems arise. Qi is the energy that helps move physical substances in your body. This energy helps ensure the smooth flow of blood and lymph—both of these help clear toxins and waste from your body. Qi even helps food flow through your digestive system. When qi is not flowing smoothly, this affects the health of your ecosystem, your body. For example, if you eat too much cake during the holidays, this is the equivalent of tossing a few twigs into the river. If you have WAY TOO MUCH cake, turkey, mashed potatoes, pumpkin pie, ice cream, alcohol, etc., then this is like throwing a whole bunch of stuff into the river all at once. When you eat too much, it causes an accumulation of food in your stomach and intestines, resulting in abdominal pain. This mass of food (picture a snake swallowing a goat) can even cause qi to flow the wrong way. Instead of flowing downward to guide food through the digestive tract, qi goes upward, and this results in burping, hiccups, and acid reflux. If you ate like this every day, it would be like dumping debris in the river daily. At some point, it’s going to be too much for the river to clear away. This is the equivalent of people throwing trash in the river. Eating a ton of crap all the time and being exposed to environmental toxins (there’s one more thing that’s extraordinarily toxic to the flow of energy, but I’ll talk about it in Part 2) are not conducive to the proper flow of qi. They aren’t twigs and leaves. They’re the shopping carts and old tires. So now you can see how from a Chinese Medicine perspective, the accumulation of toxins in one area is due to a lack of flow. It’s just like a river. Qi and blood are not circulating as they should so toxins are not being flushed away. The toxins then settle in the area, or areas, of the body that are prone to energy blocks, and then an abnormal growth may take root. I’ve got lots more to share on why certain areas of the body are more likely to have energy blocks. But I’ll tell you why in Part 2 when I get to the Dragon Spirit perspective and the mind body connection. As I mentioned earlier in this article, saying that an abnormal growth is an “accumulation of toxins,” or due to blocked energy, or a lack of flow of qi and blood is an oversimplification of Traditional Chinese Medicine theory. There are always underlying disharmonies, deficiencies, and disruptions in the body and its energy meridians that create the breeding ground for an accumulation of toxins and the stagnation in the flow of qi and blood. Each person has their own unique combination of disharmonies in their energy meridians, and these disharmonies are often years in the making. The best way to determine what’s going on in an individual is for a TCM practitioner (here in the U.S., that would be a licensed acupuncturist) to examine the person in person. The acupuncturist will ask a series of detailed questions about a person’s health and lifestyle. Then they’ll come to a conclusion, identifying which meridians are affected and what the imbalances are in each. Based on this meridian diagnosis, the practitioner will likely prescribe a formula of Chinese herbs to address the toxins and the underlying imbalances in the individual’s body. It’s not as simple as saying, “Use this herb for the imbalance in this meridian and that herb for the imbalance in that meridian,” because no one is a textbook perfect case of an organ or meridian disharmony. Herbal formulas are a blend of different herbs in varying amounts, and they are designed to work synergistically together. Everything in the body is interconnected. An imbalance in one organ and meridian may severely impact another, and even change the appearance of symptoms. That’s why it’s so important that the herbal formula and acupuncture points are customized for the individual. Chinese Medicine always looks at treating the whole person, and creating an individualized treatment plan. What might work for one person would be less effective for another. Things can get really complicated, and that’s one of the reasons why I love Chinese Reflexology. It’s simple to learn and practice, and eliminates a lot of the complexity. Basically, any organ or meridian with an imbalance will show up as a sensitive point on your foot. But don’t be pressing away on your feet yet because anyone with a chronic health condition needs to take a systematic approach to healing, or they’ll end up feeling worse. This is one of the reasons why I created the 6-month Sole Mastery program. Six months is enough time to harmonize the imbalances that are at the root of chronic health conditions. And because I keep the class size small, I get to know my students. I get to know who you are and what your health challenges are. We work together for six full months so that you get a whole body approach to wellness and your very own individualized healing plan. While there is a recommended routine for practicing Chinese Reflexology points, you get faster and more impactful results when the routine is customized for you. In that way, it’s a lot like getting an herbal formula selected just for you. The points and massage times are adjusted to help you meet your health goals faster and more effortlessly. I only teach this program once a year because I’m a full time mom. Just take a look at any school schedule and you’ll see it’s nearly impossible to set aside six months without huge blocks of holidays and conference weeks. The best time for me to teach the Sole Mastery program is in the fall, and enrollment usually begins in August or September. 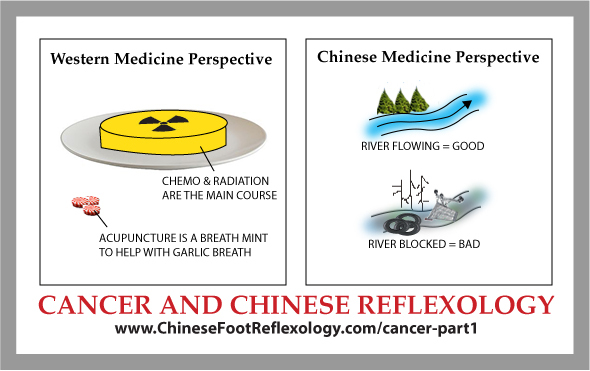 Stay tuned for Part 2 and 3 of this article on Chinese Reflexology and cancer. I’ll share why certain areas of the body are more susceptible to energy blocks in Part 2. You may also be wondering if you can use Chinese Reflexology for cancer, or if you can practice reflexology on someone who has cancer. I’ll talk about this in Part 3 of the article, where you’ll also learn some beneficial Chinese Reflexology points. But are they good reflexology points for cancer? Lol, just refer back to what I wrote about the Western perspective on cancer. You’ll see the answer to this question there. But I will say that the reflexology points (and acupressure points) in Part 3 are good for clearing toxins and promoting the flow of qi, blood, and lymph. I am desperate to see part 2 and 3′ can’t wait. Can you please send am syllabus of Sole zGuidance? How is it taught? As a webinar?